Calculus for Scientists and Engineers: Early Transcendentals, Single Variable 1 Edition Drawing on their decades of teaching experience, William Briggs and Lyle Cochran have created a calculus text that carries the teacher’s voice beyond the classroom. That voice—evident in the narrative, the figures, and the questions interspersed in the narrative—is a master teacher leading readers to deeper levels of understanding. The authors appeal to readers’ geometric intuition to introduce fundamental concepts and lay the foundation for the more rigorous development that follows. Comprehensive exercise sets have received praise for their creativity, quality, and scope. 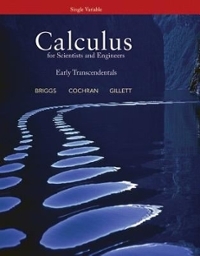 This book covers chapters single variable topics (chapters 1—10) of Calculus for Scientists and Engineers: Early Transcendentals, which is an expanded version of Calculus: Early Transcendentals by the same authors.